Cook bacon fully. Do not overcook the strips that they become too crispy and cannot wrap around the brussel sprouts. 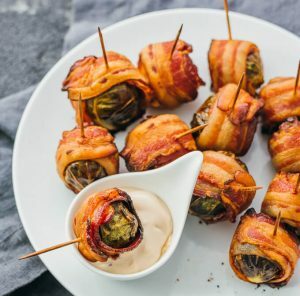 Wrap sprouts with a slice of bacon. Bake in oven at 400 degrees for 40 minutes. Blend Sicilian Lemon balsamic in with mayonnaise. Brussel Sprouts can be served hot or cold!